Bundles are usually between £42 and £46.50 each! 2 for £72! They have Charmander, Meowth, Bulbasaur, Squirtle, Pikachu, Evee and Vulpix. 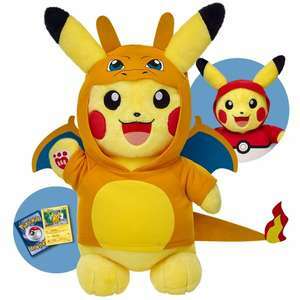 Bundles include: stuffed soft toy, clothing sound and an exclusive Pokemon card. We took our youngest to a Build a Bear earlier this year. Hard sell, every, single, ***ing second. We won't be going there again. Better to buy a Pokemon teddy from Argos or eBay, just a few quids, you can have any of them. Mine came with a £10 voucher in the box!